Casseroles are a favorite easy meal for my family, especially during the busy holidays. This Overnight Eggs Benedict Casserole is perfect for brunch and the upcoming Easter weekend because you prepare it all the night before and just bake it in the morning. 1. Grease a 13X9 baking dish. 2. Add chopped English muffins to the bottom of the pan. 3. Add diced bacon scattered on top. 4. In a large bowl, whisk together eggs, milk, garlic powder, and onion powder. 5. Pour on top of the bread and bacon. 6. Cover and place in the fridge overnight. 7. In the morning, remove casserole from the fridge. 9. Sprinkle paprika on top of casserole. 10. Cover with aluminum foil and bake for 35 minutes. 11. Wash asparagus and cut off the tips. Reserve remaining asparagus stems for use at another time. 12. Remove casserole, uncover, and add asparagus tips to the top. 13. Bake for 15 more minutes. 14. 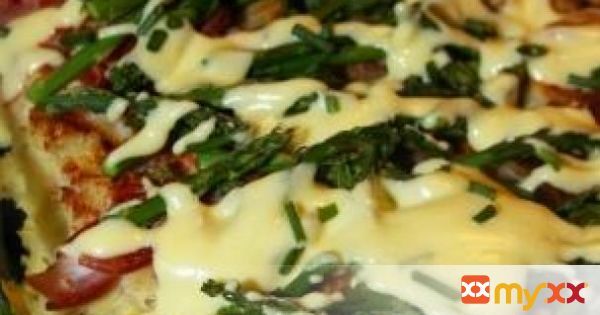 Remove from oven and drizzle with hollandaise sauce and top with chives. 15. Cut into squares and serve warm for breakfast or brunch. 17. Melt the butter slowly in a small pot. Try not to let it boil – you want the moisture in the butter to remain there and not steam away. 18. Add the egg yolks, lemon juice, salt, Dijon, and cayenne (optional) into a bowl. Blend the egg yolk mixture at a medium speed with an immersion blender (or use a traditional bender or a whisk) until it lightens in color, about 20-30 seconds. 19. Once the yolks have lightened in color, turn the blender down to its lowest setting and drizzle in the melted butter slowly, while the blender is going until it is a smooth sauce. *You can also use a whisk and stir constantly over a double boiler. 21. Can be made the night before, refrigerated, and reheated the next morning.